Ben Wilden may not be what you expect a national champion to be. Witty, down-to-earth and very personable, he is very well deserving of his success in trampolining and wears his title with a sense of pride. Ben has won countless competitions and wowed world-class judges with his intricate routines, but don't think that he has let all of the fame go to his head. Ben's story is one of hard work, dedication, and staying grounded along the way. After starting his Olympic trampolining journey on a trampoline in his parent's backyard in Adelaide, Ben is very grateful for the guidance of his father during his early years. He has said that his father was very involved in his trampolining, and taught him new tricks as well as important safety techniques, which proved to be a crucial combination of skills when training to become an Olympic athlete. Just one week of beginner trampolining classes, Ben was ready skilled enough for the intermediate group. It wasn't long after that he was accepted into the advanced class, which fuelled his passion for trampoline sports and encouraged him to enter into competitions before the age of nine. Excelling in interclub competitions, Ben soon soared to novice championships. After winning both Australian state and national championships, he secured his position as one of the most promising young athletes of any sport in the country. Ben's victories were not going unnoticed. As a result of his phenomenal routines, Ben was invited to join the Senior National Squad in 2002. This fuelled his drive to work even harder, be better and improve more. He entered more trampoline competitions and continued to set personal goals for himself along the way. In 2007, Ben competed in no less than seven international competitions, and won several medals. His fame grew when he won the gold medal at the World Cup for men's synchronized trampolining that same year. During a competition in 2008, Ben blew the judges away with an incredible trampoline routine. His dreams were realised when his score was high enough to qualify him for the Beijing Olympics, which is an amazing achievement. Although the qualification was an incredible honour, it was also incredibly expensive. At the time, Ben was working in a bar in Adelaide, and was forced to use his ingenuity. Not going to the Olympics simply wasn't an option; he simply had to work harder to achieve his dreams. Ben struck a deal with his boss and created a cocktail he named ‘The Beijing Dream'. "I really pushed that drink," he said. "If someone would ask what I would recommend, I would make it for them. I charged $5.00 for it and got 100% of the profits!" Through pure hard work and dedication, Ben earned the funds that he needed to compete among other champions from all over the globe. The day of his Olympic competition was heart-wrenching for Ben, as he narrowly missed the cut for the finals. "I was very excited on the day of the competition," he said. "I had a sore knee, but I pushed through. By the time it was time for me to compete, it was a different experience. I heard the roar of the crowd in reaction to the Chinese competitor before me, and I began to feel so nervous. Suddenly, the lights got brighter, the crowd got louder, and my legs turned to jelly." After a disappointing first routine, Ben was grittily determined to excel in his second performance. "I had nothing to lose after the first," he said. "I was going to do the best routine I've ever done or fall off trying!" His determination paid off, and Ben performed an unblemished routine to complete his Olympic experience with a personal best record. "I learned a lot from that experience," he said. "It taught me a lot about training. If your training is correct, you can't go wrong." 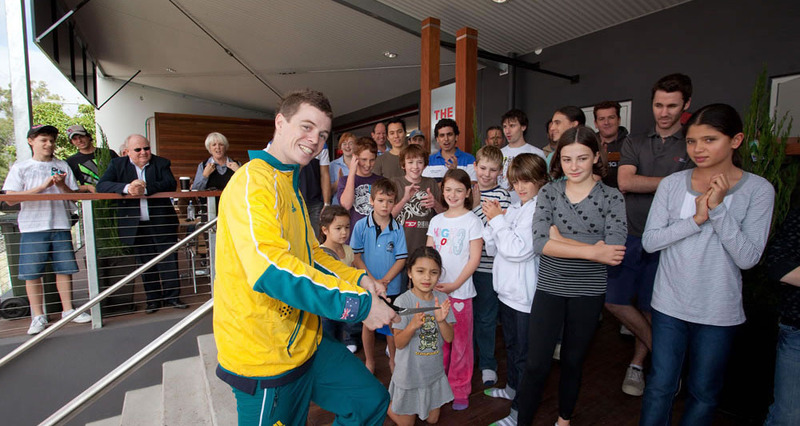 Since the Olympic competition, Ben has continued his reign as the top male trampolinist in Australia. Although he's achieved incredible feats on an international stage, Ben's career hasn't been without injury. In 2000, he began to experience back issues and was diagnosed with Sherman's disease (also known as Scheuermann's disease), which meant his bones were too soft at the core. His six month recovery saw trampoline training replaced with seemingly endless physiotherapy and chiropractic appointments three to five times each week, and his condition began to take a toll on his drive to succeed. "I became depressed and down," he said. "I thought about quitting. At 15, I was too young to understand the mental effects of a sports injury." Fortunately, Ben's mental determination began to heal with his body, and he pushed through his pain and disappointment to pursue his dreams. The time and effort that Ben spent training wasn't the only thing he had to sacrifice to becoming a champion. "I had to give up a lot of things," Ben said. "Because my schedule was so hectic, I had to give up my career as a jeweller. I couldn't go to parties on the weekends with friends. Any holidays or breaks that I had were used for competitions. " Despite this, his friends, family, and romantic partners were always very understanding of his dreams. Ben became even more determined to excel in trampolining after his father passed away in 2009. "I do the sport as a tribute to my dad now," he said. "It gives the sport extra meaning." It may be surprising that becoming a professional athlete was not something that Ben ever planned to do. "It was not a conscious decision, but that was the path that happened," he said. "I had little goals that led to big goals. When you set those goals, you realize that you're not far off from the big ones." Today, Ben uses his trampoline skills in a new and exciting way. He was recently accepted as a member of Cirque Du Soleil and is moving to Los Angeles, where he will continue to stun and awe audiences from all over the world. He is still passionate about trampolines, and offers inspirational advice to other budding champions. "You have to dream big, and don't be afraid of your dreams," he says. "If you want to achieve something, you have to go get it and really make it happen. Don't listen to those who tell you can't."